Open Plan Mandap setting is a unique was to set the scene for your big day. It enables you to adapt to the varying space and tailor a look just for you. Open Plan gives you the flexibility, versatility and adaptability and can dress the 4 pedestals with flowers or Ganesh murtis. The Swan Mandap, which spans 34ft wide into an oval shape with distinctively Swan like carved pillars. This Mandap has integrated lighting and 6 pedestals and matching gate to compliment. As elegant as is or can be dressed with themed drapes or flowers. 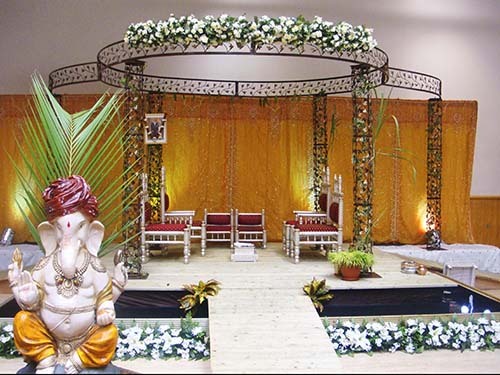 Our Ganesh Solid Wooden Carved Mandap embodies the essence of tradition in a contemporary way. 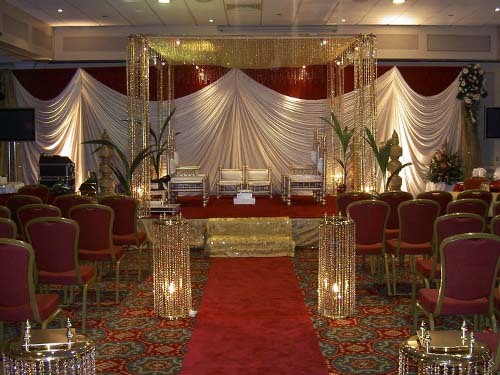 This elegant mandap has the option of 4/6 pillars and can be opened up for a reception stage styling. 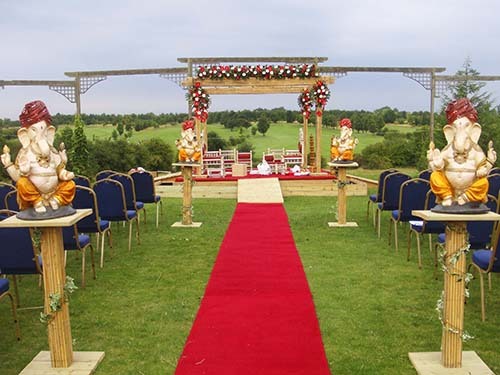 The Iron Mandap will bring to life any venue, especially in the outdoors. 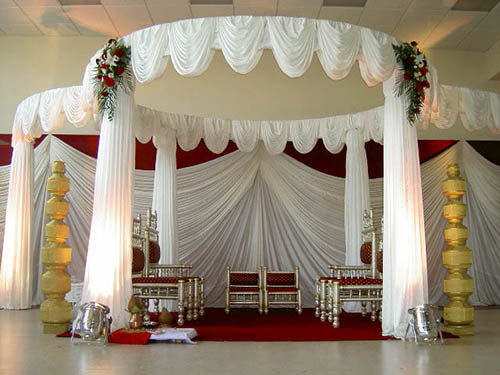 This 4/6 pillar mandap can be dressed in flowers and drapes or just left to look naturally elegant. Event Gurus has beautifully crafted this handmade Glitzy Crystal Mandap . It has over 40, 000 crystals from Austria and assembled the UK. This 4 pillar luxury mandap makes a profound statement at any venue and would make your big day feel like royalty. Event Gurus has a unique selection of mandaps. We are flexible in meeting our clients requirements and can dress the mandap in various ways to create that personal touch. We source our materials from all over the world and Event Gurus have also designed and created many mandaps by hand. 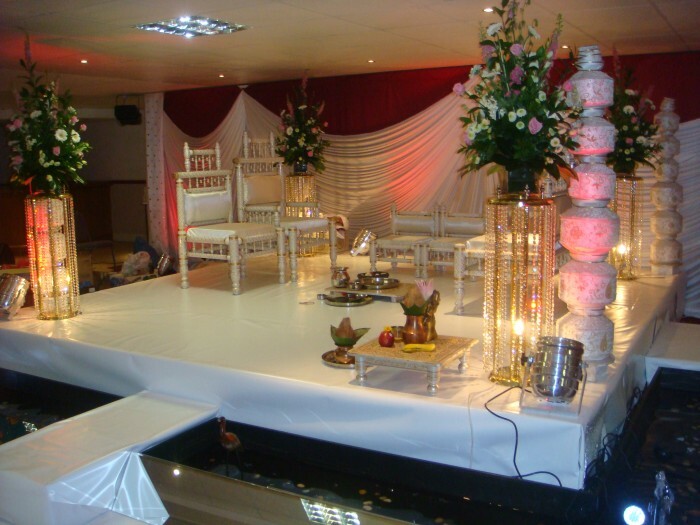 Our latest creation is the Swan Mandap and Floating Bamboo Mandap set in the middle of water with fountains. We have a wide range from traditional to contemporary mandaps. 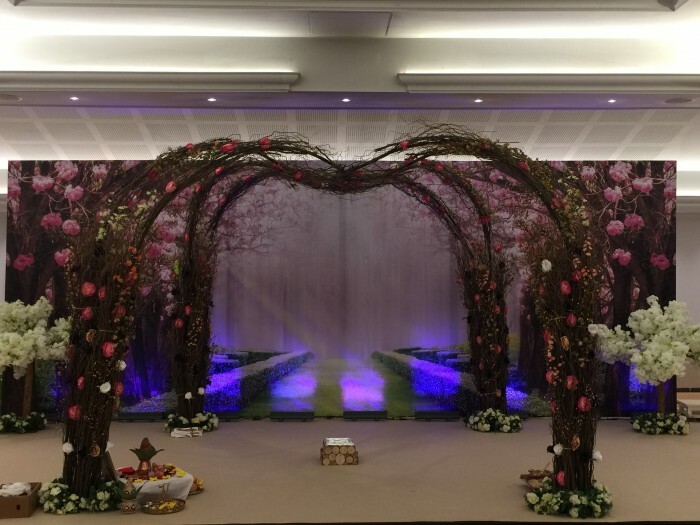 Our unique designs also allow our mandaps to open up to create the perfect backdrop for your event. 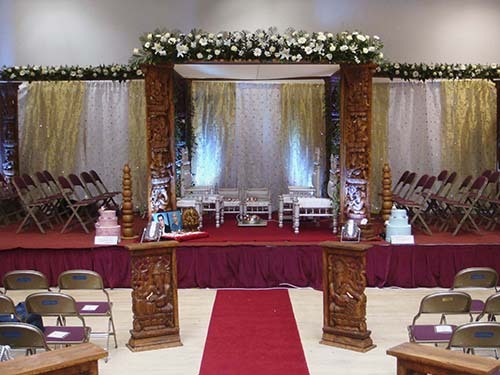 If you have a particular look or design, we can also create a unique mandap or bespoke stage design for you.